Back when Yard Sale Bloodbath was still active, we had a policy that it was too boring to ever start a blog post explaining why it had been so long since we’d done a blog post, so … Let’s just leave it up the imagination and get right to the goods. When we were little, Lina and I used to do stuff together all the time. We still like each other, but now she has her friends and I have mine. Or at least she has hers. People always circle around her. Girls and also boys. And now men too. That’s why she’s in therapy. Because of a man. A substitute teacher. Although I don’t think he’s going to be a substitute teacher any more. Then in January, another publication! This time “Where the Spirals Lead” appeared in Adelaide Literary Magazine. She was beautiful—which I suppose shouldn’t have been surprising: she was Allie’s mom, after all, and they had the same bronze skin, the same piercing eyes, the same thick mane of dark hair, though her mom’s was shorter and tinted with a burgundy sheen. Everything about her seemed deliberately curated: green jumpsuit, golden scarf, red lipstick, things that you wouldn’t have thought would go together but somehow made a striking effect. She seemed to come from a completely different world than my mom, with her stringy hair and thick mascara and beaded halter tops and old suede jackets. Her slew of awful boyfriends. Her huge drafty house with dirt-cheap rent because she used to party with the landlord back in the day. 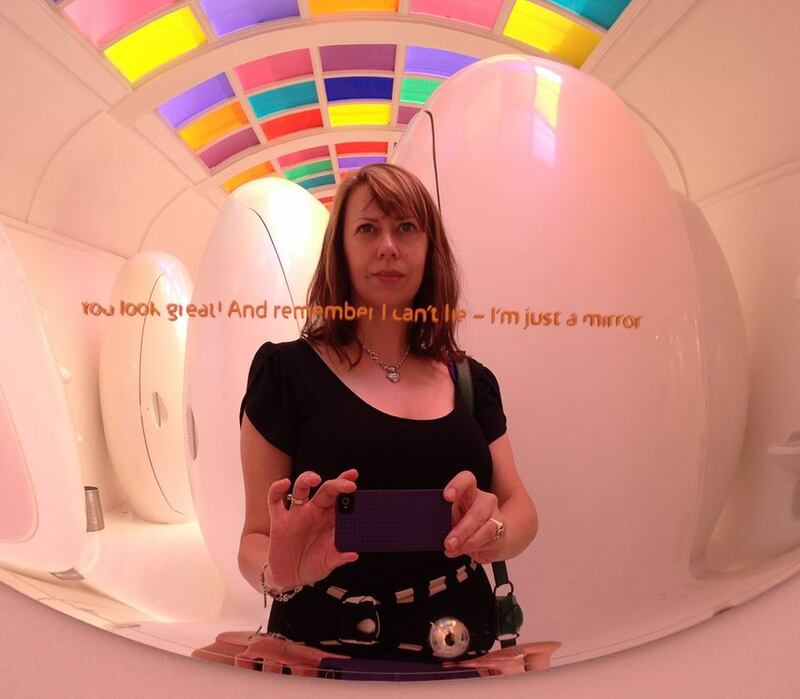 Exciting stuff after what felt like eons out in the barren wastelands of Rejectiontown … and most recently I’m thrilled to have a tiny poem, “Feminist Cocktails”, in the Unchaste Anthology Vol. 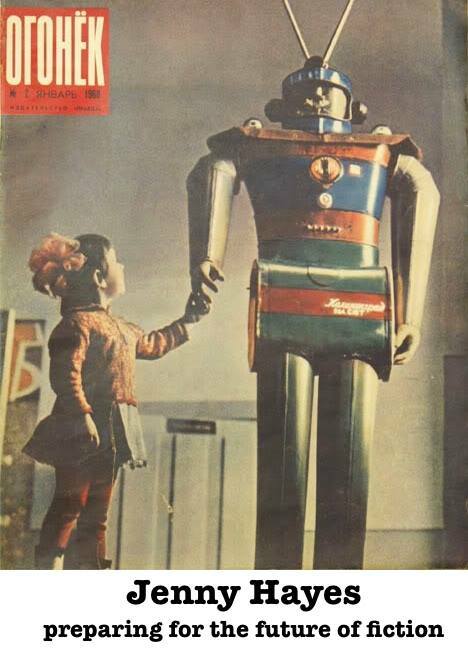 3, a publication from the fab Unchaste Readers. 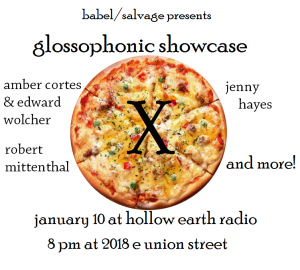 To steal from their website: Please come to Table T2060 at the Oregon Convention Center during AWP, March 2019… Many of the Unchaste will be there with their beautiful books and other merch. I’ll be one of them, hanging around the table and selling a handful of the last remaining copies of my chapbook Dear Rosie AKA Ro-Ho-Zee AKA Rosarita Refried Beans (an illustrated version of this short story in letter form) and trying not to succumb to AWP freakout … who am I kidding, freakout will be surely be had but I hope to make it the most enjoyable freakout possible!! Slacked off on the posts the last couple of years. I hear blogs are back though?! Anyway, we’ll see what happens. Meanwhile, the Writing section is sparkling fresh, so feel free to take a gander. Or a goose. Or whatever you can find. I am doing two readings this month and since the organizers of each have come up with amazing graphics, I think this time I’ll just let the pictures do the talking. And what the hell, let’s add a picture of me reading! 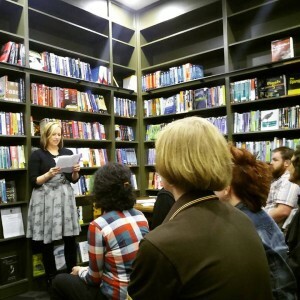 This one’s from the “On the Spartan Side” Lit Crawl reading back in October, courtesy of Spartan editor Ross McMeekin. I can’t read the title above without thinking Reading chicken soup with rice. Which sounds pleasant, really, in this crisp October weather! But soup aside, I have two readings coming up. First, it’s a thrill to be part of Lit Crawl Seattle again this Thursday, Oct. 22nd. Then a week later it’s time for another installment of the always delightful Dock Street Salon (hosted by local publisher Dock Street Press) at Phinney Books, Thursday Oct. 29th at 7 PM, featuring me and Nicole Hardy! There was talk about making this a whole kooky Halloween themed event — bobbing for apples was mentioned — but I don’t think that’s actually going to happen. Which is probably for the best. Still, feel free to come in costume if that’s your thing. Finally I just wanted to echo the thoughts in this fantastic Resources page put out by our local new wundersite Seattle Review of Books: “Seattle is right now in the middle of a great and vibrant literary boom. All over the city, you’ll find literary organizations, libraries, bookstores, and festivals celebrating writing, comics, and the pleasures of publishing…” It is so true, and so fantastic. I’m happy to be a part of it. Here is a video of my reading at Seattle Fiction Federation in June. I was a little nervous when I realized they were recording us, but now I’m really thrilled to have this captured. I’m glad I chose “Words in Black Marker” – it’s not a new piece but one I like a lot, and had never read to an audience before! The whole night was such a blast (check out the videos of my fellow readers Ian Denning, Kristen Millares-Young, and Sheldon Costa). The organizers are the best and the format is lots of fun, with the randomly-selected volunteers from the audience mixed in with the longer featured readers. I’m already looking forward to the next one. 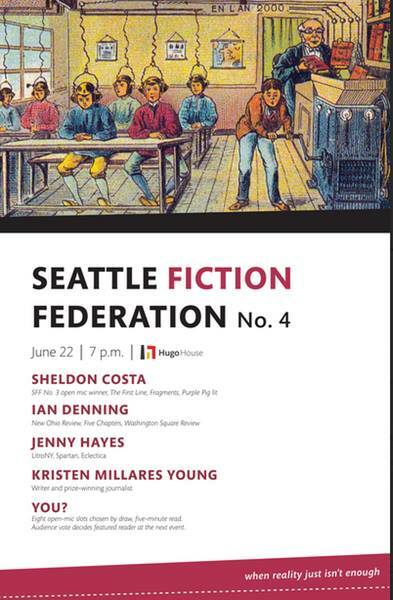 On Monday, June 22nd I’ll be reading at the 4th installment of the Seattle Fiction Federation, which is definitely a contender for coolest reading name around. The concept is pretty cool too: along with four featured readers, audience members can sign up to participate in an open mic. Eight readers are chosen at random, and then the audience votes to determine which one should be a featured reader at the next event. Like so many good things, it takes place at Hugo House. Check out Seattle Fiction Federation on Facebook for the event invite, along with some awesomely ridiculous promotional material to go with #4’s futuristic theme. Like this. One of my sisters suggested making this into a business card. The other suggested getting it as a back tattoo. I think maybe they’re both right. I wrote a story called “The Stories” … which is perhaps a bit of an odd title. But it’s one of my very favorites. It’s also super short and was just published in New Flash Fiction Review. Usually when I do one of these “woooo! new story published!” posts I put a few lines in as a teaser, but since it’s so tiny I think you should just go read it and see what those stories are all about. I like the idea of picking a song that somehow fits a story (a la WhiskeyPaper) and when I was thinking about this one I went back to the 90s and the girls I hung out with then who might have had stories and friendships a bit like these and this song popped into my head. I couldn’t remember most of the lyrics or the title but as it turned out it is kind of perfect. Speaking of stories on the shorter side: I’m reading next Thurs., March 26 at an event hosted by Spartan, where anything over 2,000 words is just not happening. The reading is one of many events next week as part of the APRIL Festival. 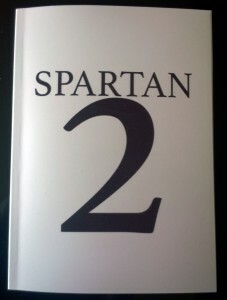 It also serves as the release party for Spartan Annual #2. 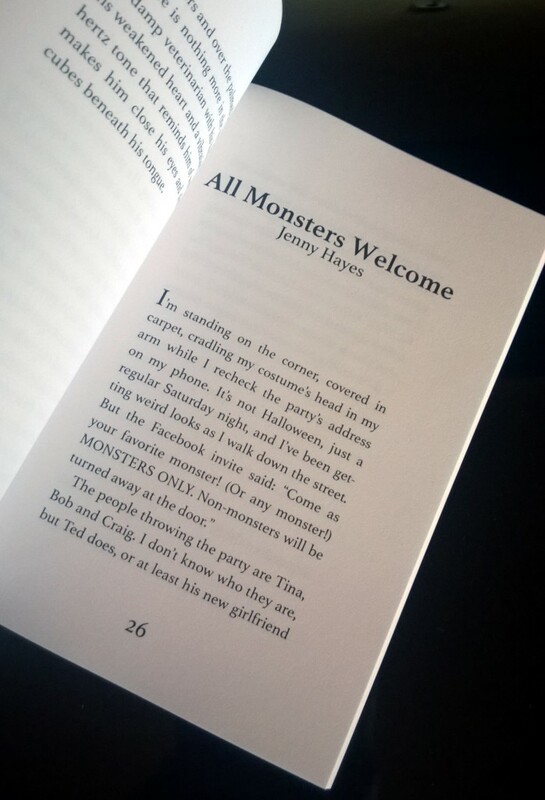 “All Monsters Welcome” is included in that. I love online literature (duh) but I don’t think I’ll ever stop getting excited about seeing my work in print. The reading includes fellow Spartan contributors Ann Teplick, Donna Miscolta, Erik Evenson, and Q. Lindsay Barrett. 5:30 (happy hour!) at Vermillion Art Gallery. Short … and maybe even sweet. 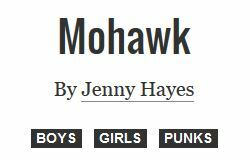 My story Mohawk was published last month at the wonderful LitroNY. I’m tempted to let those tags speak for themselves, but since you might want to know a tiny bit more: it’s a story about a girl and the guy she likes and his cool older punk rock friend. Much in the vein of my chapbook, it’s fiction that was fueled in part by details from my teenage ’80s Berkeley past. I felt a little jealous about how much Mark liked hanging out with Denny. I worried that I’d get shut out. But to my relief, Mark kept inviting me along. And Denny always treated me like one of the gang, never acting like I didn’t belong there too, even remembering that mushroom was my favorite when he snuck us free slices at work. It felt natural to joke around with him, like he was the cool big brother I never had. I didn’t find him particularly attractive, though I could see how some girls would, with his lanky body, piercing eyes, and goofy lopsided smile. And being in a band never hurt, even one like his where the songs all sounded the same. But we never saw him with anyone. Then one day in April we showed up at Denny’s and there was a girl in the chair. “Guys, this is Sara,” he said. She looked gorgeous and hard, like a dark princess, with long auburn hair, pale skin, and smudgy eyeliner. Her dusty black dress was either high-fashion or homemade, with weird drapes and ragged edges. She was taller than me. Older. Curvier. More of everything. This story went through a lot of drafts, with a lot of help from early readers, and I’m so thrilled to see it published. I hope you will check it out! Two of my short stories were published: Like I Was Waiting in Eclectica, and All Monsters Welcome in Spartan. My imaginary Infinite Jest-themed roller derby roster found the perfect home at The Toast. alice blue books released my chapbook Dear Rosie AKA Ro-Ho-Zee AKA Rosarita Refried Beans (with the best illustrations ever by Carolyn Pennypacker Riggs). 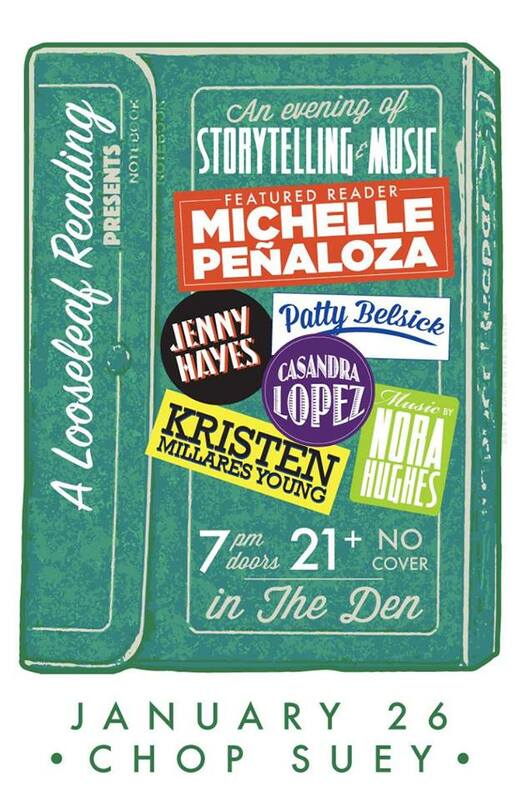 In May I read at Unchaste Readers in Portland with a stellar lineup, including several of my Wayward Writer pals: Nina Rockwell, Emily Newberry, Moe Bowstern, Dena Rash Guzman, Wendy Chin-Tanner, Margaret Elysia Garcia, Ariel Gore, and hostess extraordinaire Jenny Forrester. And in September I read at Lit Fix, which was so much fun and also gave me the treat of listening to and meeting Jim Ruland, Kelli Russell Agodon, and Susan Rich. 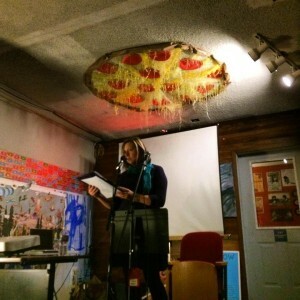 I volunteered at Lit Crawl Seattle, helping out the night of the event and also running their Twitter account. Yes, that was me making jokes about the overlapping “weed” and “food” themed readings and throwing around hashtags like #dyingofawesomeness. I went to lots of great readings and events in town, including book launches for local friends Litsa Dremousis, Anne Leigh Parrish, Judith Gille, and Theresa McCormick, and the debut of Waverly Fitzgerald‘s new mystery press Rat City Publishing. Plus, I had the opportunity to stand in front of Roxane Gay and giggle awkwardly on multiple occasions, which will probably never not be a thrill. One of those occasions being my first ever AWP Conference in February, where I loitered around the Unchaste Readers table and accepted random whiskey shots from representatives of more than one small press. I also got to convert a few formerly-online-only friends into real-people friends, including lovely magical weirdos Erin Fitzgerald and Sean H. Doyle. I got back into the Literary Kitchen for another class with Ariel Gore, which was productive and fun and inspiring as always. I did NaNoWriMo for the third time … and decided it will likely be the last time. Cranking out 50,000 words in a month was a completely invaluable experience the first time I did it, and I have nothing but love for the organization. NaNo taught me how to keep going and I will always be grateful for that. But now I think I’m better off taking more time to write fewer words. On the other hand, I did get a (very rough) draft down of a story I’ve been thinking about for a while. Whether I ever take it any further or not, it feels good to have it out of my brain. Of course, there was also a bunch of other writing that didn’t result in anything I can link to or point at … yet. And I read a lot and maybe one of these days I will start keeping track of books and stuff but obviously that hasn’t happened yet. And I’m excited to start 2015 with a literary bang: I’ll be reading on Thursday, Jan. 8th at Hugo House for the next installment of the always-entertaining, free-donut-laden Wage Slaves: Tales from the Grind series. Plus I have some other secret squirrel stuff in the works … so stay tuned! And have a super fantastic new year. You look great. Really.